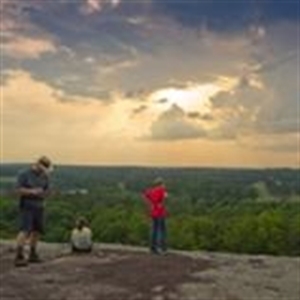 Metro Atlanta is a premier destination for business professionals, families and retirees. The area is home to 5.6 million people and more than 150,000 businesses. Metro Atlanta’s diverse economy, global access, abundant talent, low costs of business and living, and vibrant quality of life are reasons to choose metro Atlanta. The Atlanta Metropolitan Statistical Area (MSA)of 29 counties is the business capital of the southeastern U.S. and a global business hub. Metro Atlanta is one of the fastest growing metros in the U.S. and has the 10th largest economy in the U.S.
winters, warm summers and plentiful rainfall. five runways that serve more than 95 million passengers a year. Located in the southeastern region of the United States, more than 80 percent of U.S. consumers can be reached from Atlanta in two flight hours. 80 hospital locations and over 100,000 healthcare practitioners and technicians. Metro Atlantans have many opportunities for outdoor recreation, arts & culture, festivals and sporting events. Includes Cities/Towns: Atlanta, Douglasville, Forest Park, Newnan, Riverdale. & Gwinnett County Transit connect into MARTA at various points. Jan 32.4 F° 42.5 F° 52.6 F° 4.4 "
Feb 36.0 F° 46.6 F° 57.2 F° 5.0 "
Mar 42.0 F° 53.6 F° 65.2 F° 4.9 "
Apr 49.6 F° 61.5 F° 73.4 F° 3.6 "
May 58.0 F° 69.1 F° 80.2 F° 3.8 "
Jun 66.4 F° 76.5 F° 86.6 F° 3.9 "
Jul 69.8 F° 79.6 F° 89.4 F° 5.2 "
Aug 69.4 F° 78.9 F° 88.4 F° 4.1 "
Sep 63.0 F° 72.8 F° 82.6 F° 4.3 "
Oct 51.8 F° 62.6 F° 73.4 F° 3.4 "
Nov 42.8 F° 53.6 F° 64.4 F° 4.2 "
Dec 35.0 F° 44.8 F° 54.6 F° 4.1 "
Spring temperatures are cool with averages in the low 60's and highs in the low 70's. Nights are cold with lows in the upper 40's. Summer temperatures are warm with averages in the upper 70's and highs in the upper 80's. Nights are mild with lows in the upper 60's. Fall temperatures are cool with averages in the low 60's and highs in the low 70's. Nights are cool with lows in the low 50's. Winter temperatures are cold with averages in the mid 40's and highs in the mid 50's. Nights are cold with lows in the mid 30's.